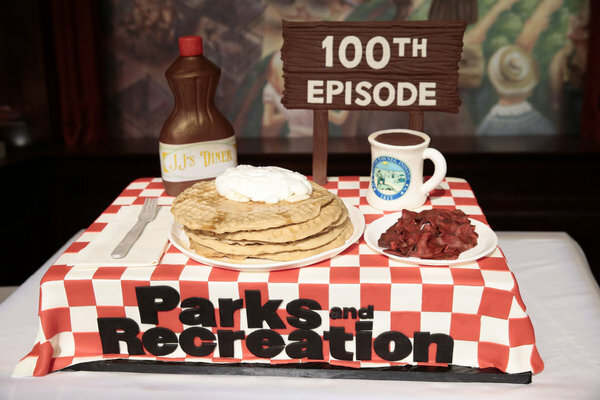 PARKS AND RECREATION has hit an important milestone — the show just celebrated its 100th episode! Take a look at some photos of cast members Amy Poehler (Leslie), Adam Scott (Ben), Rashida Jones (Ann), Nick Offerman (Ron), Retta (Donna), Chris Pratt (Andy), Aziz Ansari (Tom), Jim O’Heir (the newly dubbed Larry), Aubrey Plaza (April), and Rob Lowe (Chris), plus co-creator/showrunner Michael Schur celebrating with the very Pawnee-appropriate cake! I mean…how freaking perfect is that cake?? ?